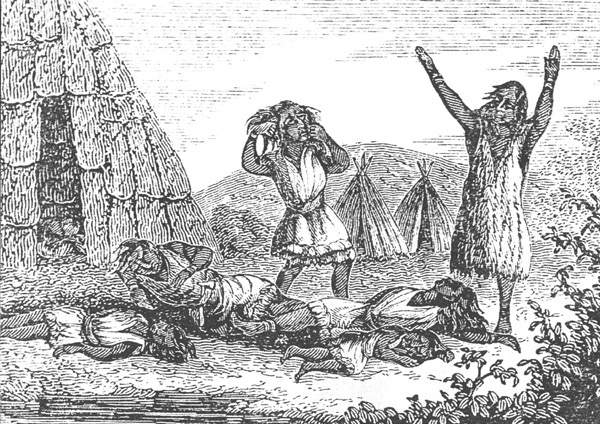 Genocide or the deliberate extermination of one ethnic group by another is not new, for example in 1937 the Pequot Indians were exterminated by the Colonists when they burned their villages in Mystic, Connecticut, and then shot all the other people — including women and children — who tried to escape. 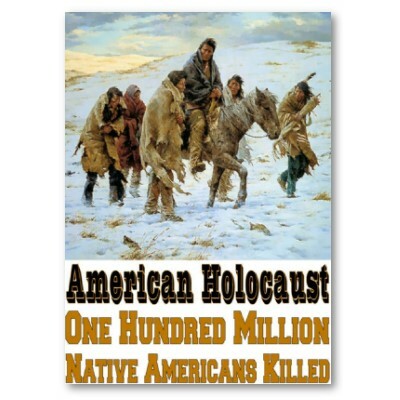 The United States Government has refused to ratify the U.N. convention on genocide. 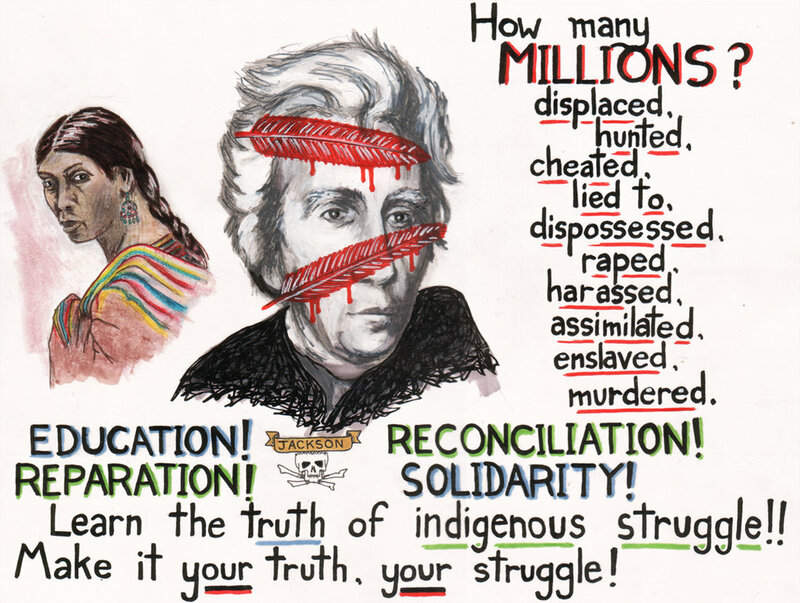 There are many facets of genocide which have been implemented upon indigenous peoples of North America. 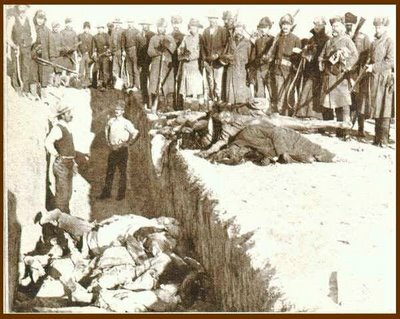 The list of American genocidal policies includes: Mass-execution, Biological warfare, Forced Removal from homelands, Incarceration, Indoctrination of non-indigenous values, forced surgical sterilization of native women, Prevention of religious practices, just to name a few. 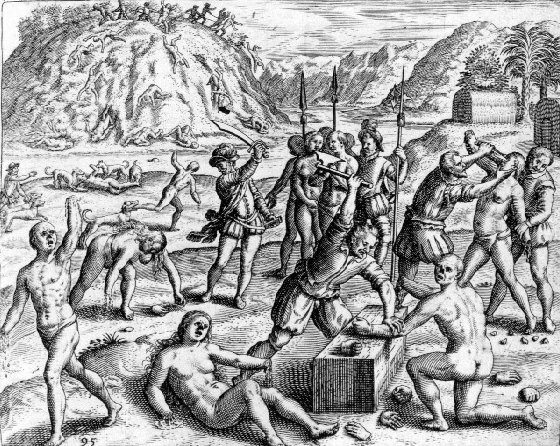 By mass-execution prior to the arrival of Columbus the land defined as the 48 contiguous states of America numbered in excess of 12 million. Four centuries later, it had been reduced by 95% (237 thousand). How? 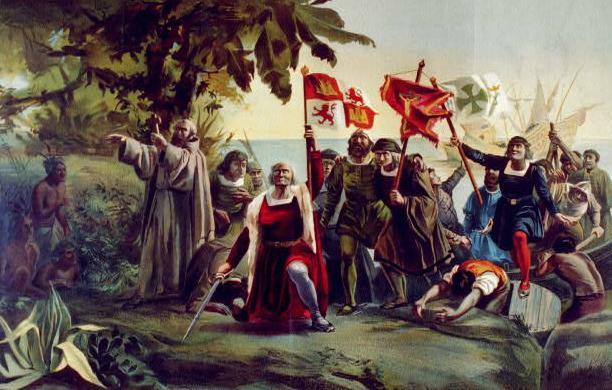 When Columbus returned in 1493 he brought a force of 17 ships. 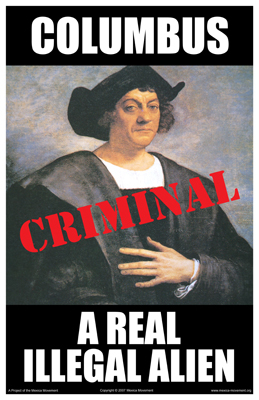 He began to implement slavery and mass-extermination of the Taino population of the Caribbean. Within three years five million were dead. Fifty years later the Spanish census recorded only 200 living! 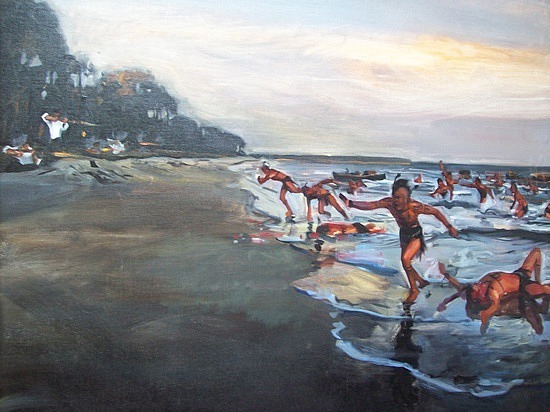 Las Casas, the primary historian of the Columbian era, writes of numerous accounts of the horrendous acts that the Spanish colonists inflicted upon the indigenous people, which included hanging them en masse, roasting them on spits, hacking their children into pieces to be used as dog food, and the list continues. This did not end with Columbus’ departure, the European colonies and the newly declared United States continued similar conquests. 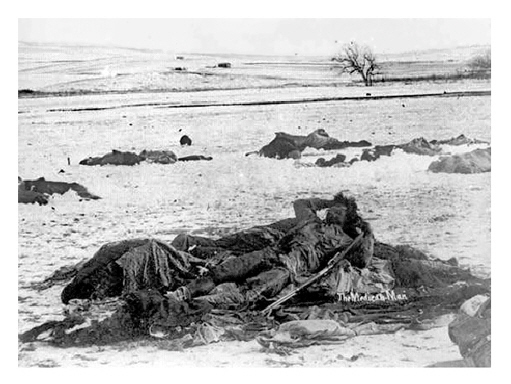 Massacres occurred across the land such as the Wounded Knee Massacre. 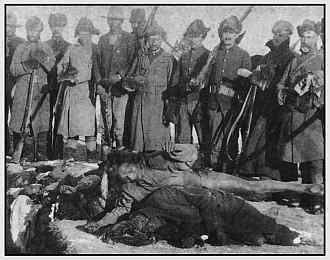 Not only was the method of massacre used, other methods for “Indian Removal” and “clearing” included military slaughter of tribal villages, bounties on native scalps, and biological warfare. British agents intentionally gave Tribes blankets that were intentionally contaminated with smallpox. Over 100 thousand died among the Mingo, Delaware, Shawnee and other Ohio River nations. 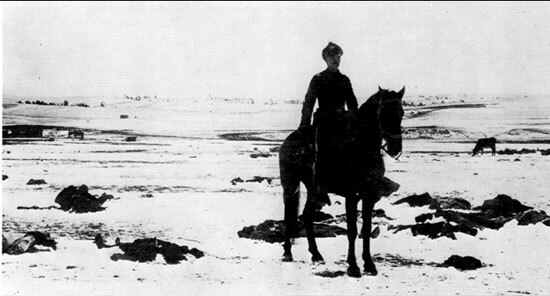 The U.S. army followed suit and used the same method on the Plains tribal populations with similar success. 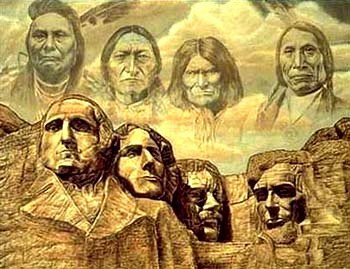 For a brief periods after the American Revolution, the United States adopted a policy toward American Indians known as the “conquest” theory. In the Treaty of Fort Stansix of 1784, the Iroquois had to cede lands in western New York and Pennsylvania. 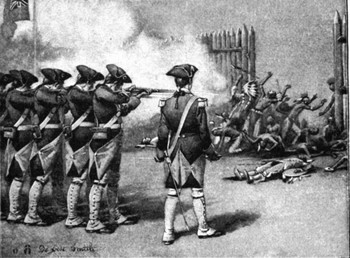 Those Iroquois living in the United States (many had gone to Canada where the English gave them refuge) rapidly degenerated as a nation during the last decades of the eighteenth century, losing most of their remaining lands and much of their ability to cope. The Shawnees, Miamis, Delawaresm, Ottawans, Wyandots, and Potawatomis watching the decline of the Iroquois formed their own confederacy and informed the United states that the Ohio river was the boundary between their lands and those of the settlers. It was just a matter of time before further hostilities ensued. 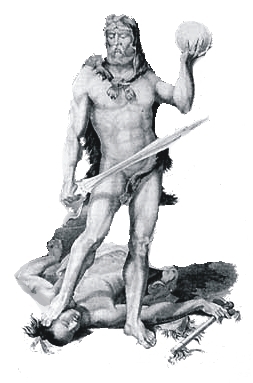 The Europeans saw themselves as the superior culture bringing civilization to an inferior culture. The colonial world view split reality into popular parts: good and evil, body and spirit, man and nature, head and hear, European and primitive. American Indians spirituality lacks these dualism’s; language expresses the oneness of all things. God is not the transcendent Father but the Mother Earth, the Corn Mother, the Great Spirit who nourishes all It is polytheistic, believing in many gods and many levels of deity. 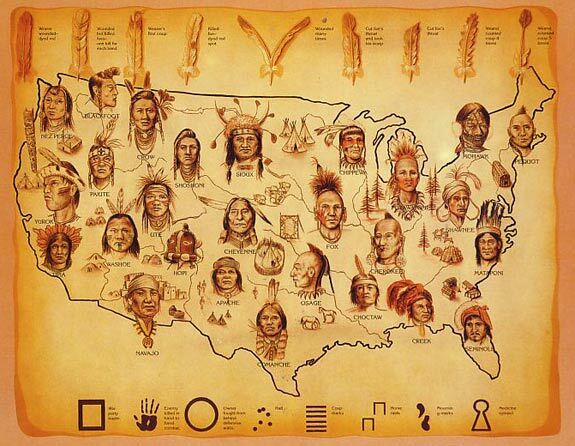 “At the basis of most American Native beliefs is the supernatural was a profound conviction that an invisible force, a powerful spirit, permeated the entire universe and ordered the cycles of birth and death for all living things.” Beyond this belief in a universal spirit, most American Indians attached supernatural qualities to animals, heavenly bodies, the seasons, dead ancestors, the elements, and geologic formations. Their world was infused with the divine – The Sacred Hoop. This was not at all a personal being presiding ominpotently over the salvation or damnation of individual people as the Europeans believed. For the Europeans such beliefs were pagan. Thus, the conquest was rationalized as a necessary evil that would bestow upon the heathen “Indians” a moral consciousness that would redeem their amorality. The world view which converted bare economic self interest into noble, even moral, motives was a notion of Christianity as the one redemptive religion which demands fealty from all cultures. In this remaking of the American Indians the impetus which drove the conquistador’s invading wars not exploration, but the drive to expand an empire, not discovery of new land, but the drive to accumulate treasure, land and cheap labor. 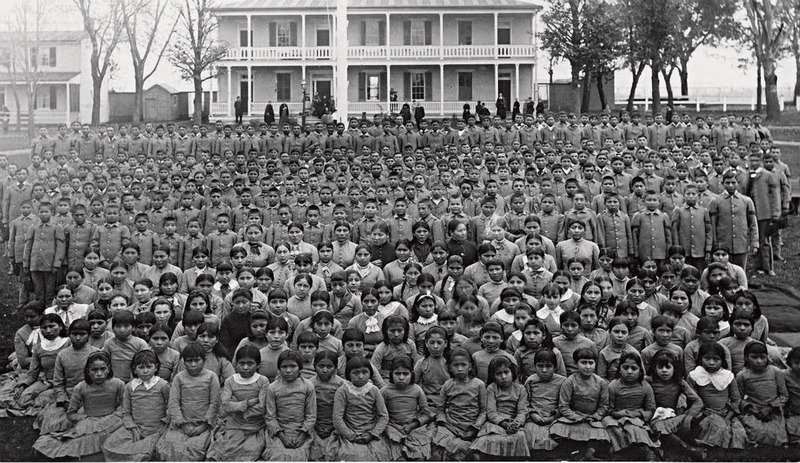 Strategies of targeting American Indian children for assimilation began with violence. Forts were erected by Jesuits, in which indigenous youths were incarcerated, indoctrinated with non-indigenous Christian values, and forced into manual labor. Schooling provided a crucial tool in changing not only the language but the culture of impressionable young people. In boarding schools students could be immersed in a 24 hours bath of assimilation. “The founder of the Carlisle Indian Industrial School in Pennsylvania , Capt. Richard H. Pratt, observed in 1892 that Carlisle has always planted treason to the tribe and loyalty to the nation at large. 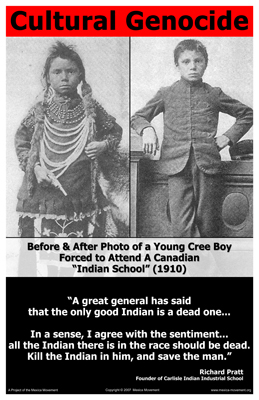 More crudely put, the Carlisle philosophy was, “Kill the Indian to save the man.” At the boarding schools children were forbidden to speak their native languages, forced to shed familiar clothing for uniforms, cut their hair and subjected to harsh discipline. Children who had seldom heard an unkind word spoken to them were all too often verbally and physically abused by their white teachers. 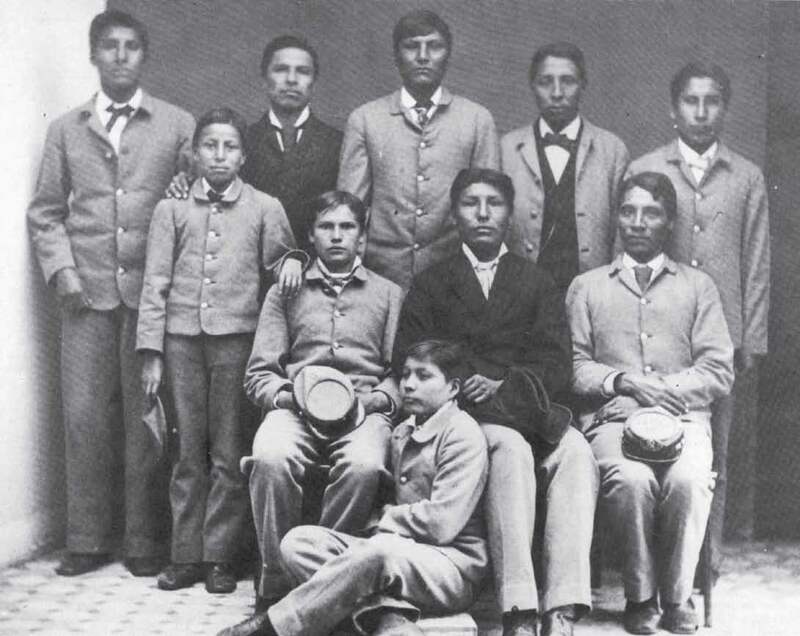 In short, “there was a full-scale attempt at deracination — the uprooting or destruction of a race and its culture.” A few American Indian children were able to run away, others died of illness and some died of homesickness. The children, forcibly separated from their parents by soldiers often never saw their families until later in their adulthood, after their value-system and knowledge had been supplanted with colonial thinking. 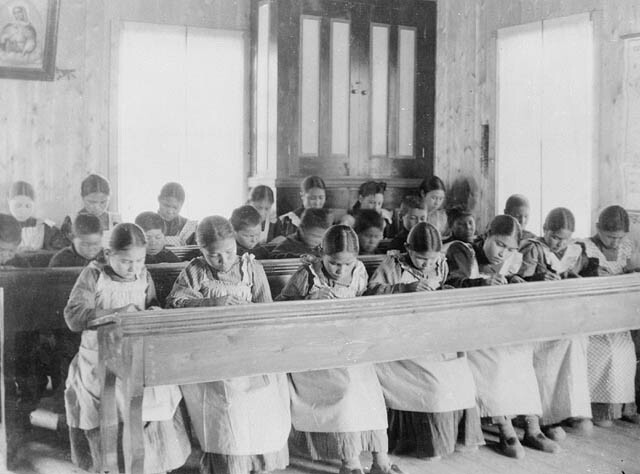 When these children returned from boarding schools they no longer knew their native language, they were strangers in their own world, there was a loss, a void of not belonging in the native world, nor the white man’s world. In the movie “Lakota Women,” these children are referred to as “Apple Children [red on the outside, white on the inside]” they do not know where they fit in, they were unable to assimilate into either culture. This confusion and loss of cultural identity, leads to suicide, drinking and violence. The most destructive aspect of alienation is the loss of power, of control over one’s destiny, over one’s memories, through relationships — past and future. Jose Noriega’s well-documented historical account of the forced indoctrination of colonial thought into the minds of American Indian children as a means of disrupting the generational transmission of cultural values, clearly demonstrates the cultural genocide employed by the U.S. government as a means of separating the American Indians from their land. The “Indian Removal” policy was implemented to “clear” land for white settlers. Removal was more than another assault on American Indians’ land titles. 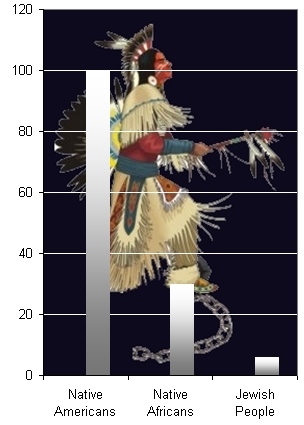 Insatiable greed for land remained a primary consideration, but many people now believed that the removal was the only way of saving American Indians from extermination. 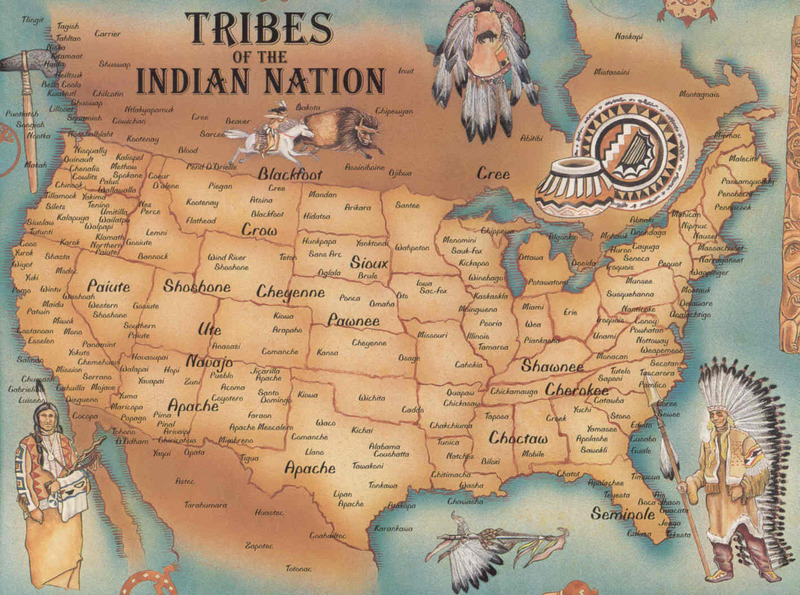 As long as the American Indians lived in close proximity to non-Native American communities, they would be decimated by disease, alcohol, and poverty. The Indian Removal Act began in 1830. Forced marches at bayonet-point to relocation settlements resulted in high mortality rates. The infamous removal of the Five Civilized Tribes — the Choctaws, Creeks, Chickasaws, Cherokees, and Seminoles — is a dismal page in United States history. By the 1820’s the Cherokees, who had established a written constitution modeled after the United States Constitution, a newspaper, schools, and industries in their settlements, resisted removal. In 1938 the federal troops evicted the Cherokees. 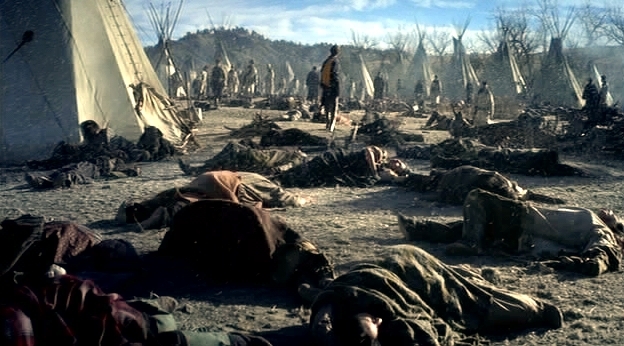 Approximately four thousand Cherokees died during the removal process because of poor planning by the United States Government. 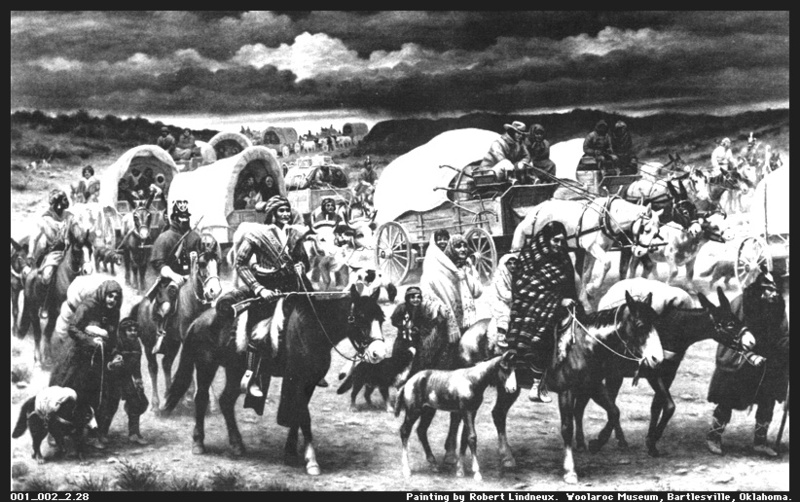 This exodus to Indian Territory is known as the Trail of Tears. More than one hundred thousand American Indians eventually crossed the Mississippi River under the authority of the Indian Removal Act. Article II of United Nations General Assembly resolution, 1946: In the present Convention, genocide means any of the following acts committed with intent to destroy, in whole or in part, a national, ethnic, racial, or religious group, as such: (d) Imposing measures intended to prevent births within the group. 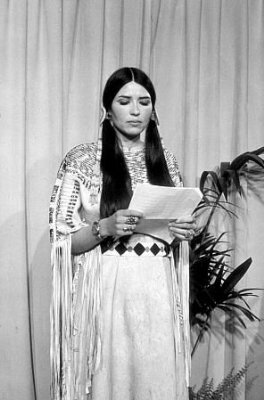 In the mid-1970s a Choctaw-Tsalagi Indian Health Services doctor was approached by a 26-year-old American Indian woman who desired a “wonb transplant.” She had been sterilized when she was 20 at the Indian Health Service hospital in Claremont, Oklahoma. It was discoverd that 75 percent of the Claremont sterilizations were non-therapeutic, that women American Indians were being prompted to sign sterilization forms they didn’t understand, that they were being told the operations were reversible, and that some women were even being asked to sign sterilization papers while they had yet to come out of birthing sedation. From the beginning of European control there has been an unrelenting drive to commit genocide over another culture. 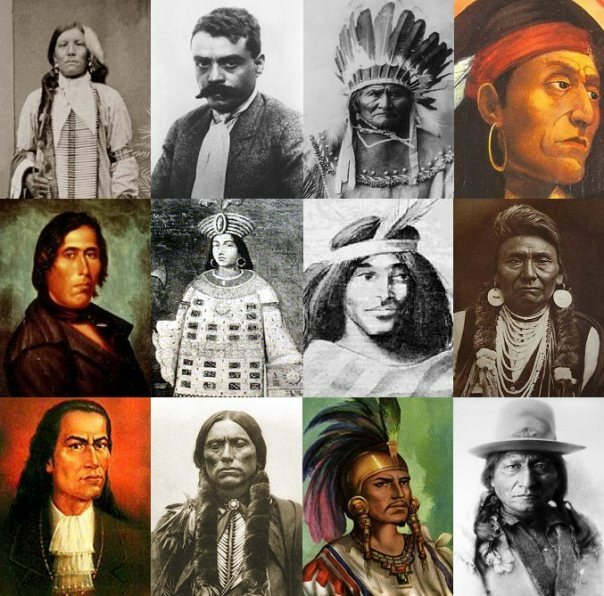 The American Indians were a majority so the Europeans called them an enemy. One of the major facts the United States Government has failed to understand is that the spiritual aspect of life is inseparable from the economic and the political aspects. The loss of tradition and memory will be the loss of positive sense of self. 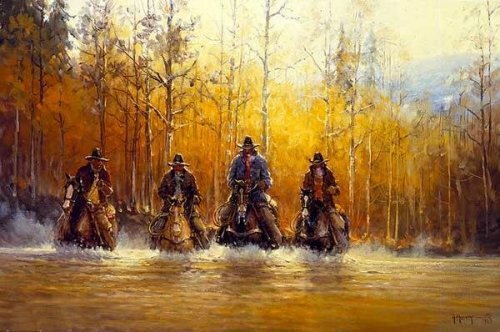 Those reared in traditional American Native societies are inclined to relate events and experiences to one another, they do not organize perceptions or external events in terms of dualities or priorities. This egalitarianism is reflected in the structure of American Indian literature, which does not rely on conflict, crises, and resolution for organization. American Indians felt comfortable with the environment, close to the moods and rhythms of nature, in time with the living planet. Europeans were quite different, viewing the earth itself as lifeless and inorganic, subject to any kind of manipulation or alteration. Europeans tended to be alienated from nature and came to the New World to use the wilderness, to conquer and exploit its natural wealth for private gain. “God said he was the father of and earth was the mankind; that nature was the law; that the animals, and fish and plants beyond nature, and that man only was sinful. You ask me to plow the ground! Shall I take a knife and tear my mother’s bosom? Then when I die she will not take me to her bosom to rest. You ask me to dig for stone! Shall I dig under her skin for her bones? Then When I die I cannot enter her body to be born again. You ask me to cut grass And make hay and sell it, and be rich like white men! But how dare I cut off my mother’s hair? 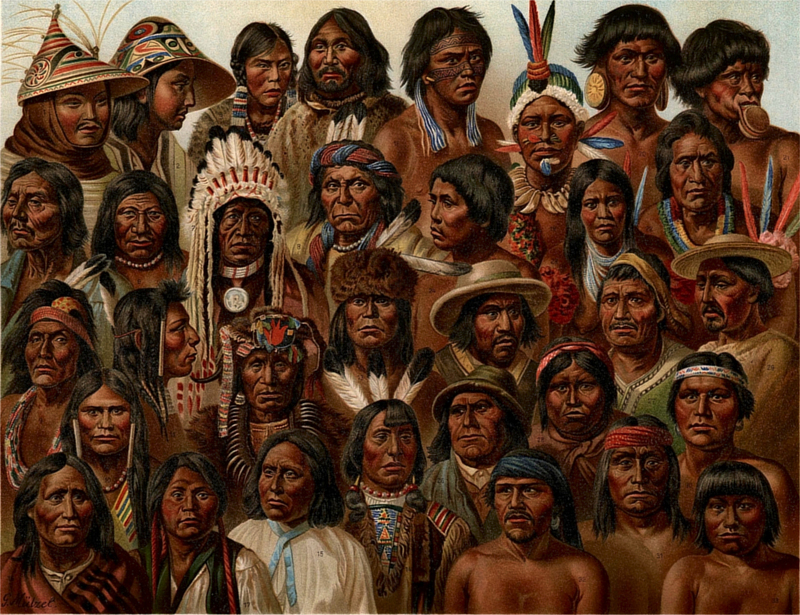 American Indians’ agricultural and medical wisdom had been ignored by the European invaders. In their rush to control the land and people much has passed them by and much has been destroyed. Sadly, what seems to have been almost totally ignored is the American Indians’ knowledge that the Earth is their mother. Because their mother continues to give us life we must care for and respect her. This was a ecological view of the earth. Mander, Jerry, In the Absence of the Sacred: The Failure of Technology and the Survival of the Indian Nations,” Sierra Club Books, San Francisco, 1992: 349. Mankiller, Wilma and Wallis, M., A Chief and Her People, St. Martin’s Press, New York, 1993: 8. Memi, Albert, The Colonizer and the Colonized, Boston: Beacon Press, 1965: 151. Olson, James and Wilson, R., Native American, In the Twentieth Century, University Press, 1988, 11. The Reader’s Digest Association, Inc., Through Indian Eyes, Pleasantville, New York/Montreal, 1995: 338. Susan Brill, Bradley U. (brill@bradley.edu) Discussion group regarding the genocide of Native peoples. Why is the biggest holocaust in all humanity being hidden from history? Is it because it lasted so long that it has become a habit? 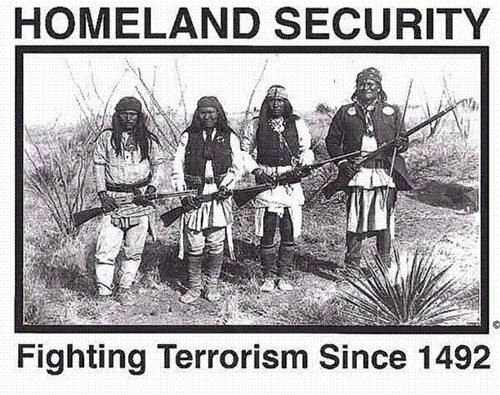 It’s been well documented that the killing of Indigenous people in the Western Hemisphere since the beginning of colonization has been estimated at 120 million. Yet nobody wants to speak about it. In the west there are a whole series of Eichmanns. 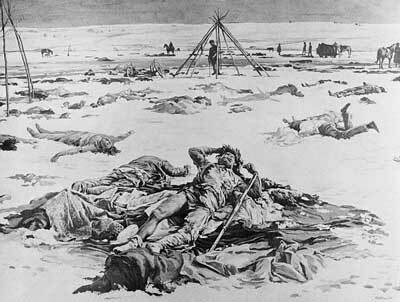 General Amherst ordered the distribution of small pox infested blankets to kill of our people. But his name is shamelessly preserved in the names of towns and streets. George Washington is called the “village burner” in Mohawk because of all the villages he ordered burnt. Villages would be surrounded. As the people came running out, they would be shot, stabbed, women, children and elders alike. In one campaign alone “hundreds of thousand died, from New York across Pennsylvania, West Virgina and into Ohio”. His name graces the capital of the United States. The smell of death in their own backyard does not seem to bother North Americans. This is obscene. Excerpted from Rachel’s Environment & Health Weekly newsletter, #671, “Columbus Day, 1999,” by Peter Montague (National Writers Union UAW Local 1981/AFL-CIO), with added section titles and notes where indicated. General Philip H. Sheridan was the commander of the United States forces […] he had plans of exterminating the buffalo. 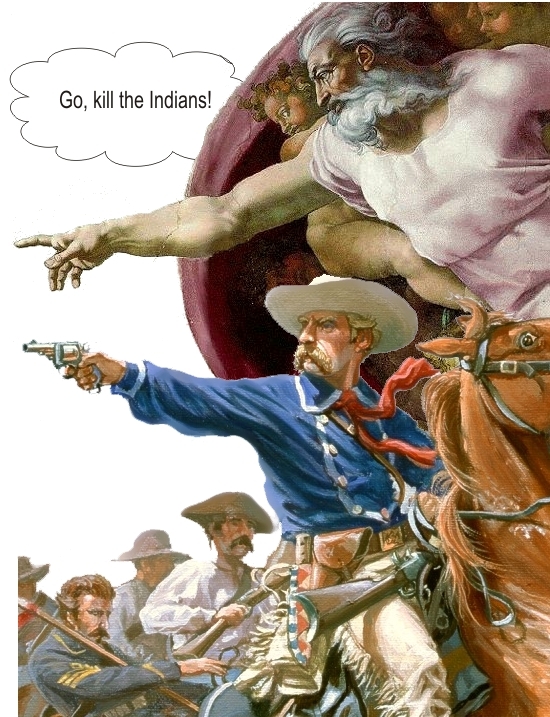 He thought this would kill the Plains Indians. 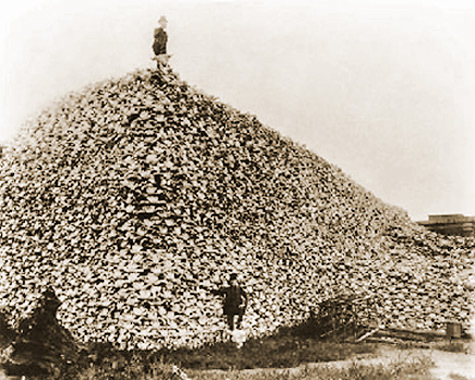 “Kill the buffalo and you kill the Indians” he said.